Attention web designers: consider using a bad monitor! That’s an odd thing to suggest, isn’t it? We digital designers love us some shiny tech. From Retina MacBook pros or the new 5K iMacs to the latest hi-res displays from Samsung or Dell, what we view our work on is important to us, for better or worse. There’s only one problem: most people don’t have fancy monitors like ours. The majority of our users have average-to-bad screens to view our beautiful designs on. That subtle grey you’ve used is lovely, but on that 5 year old, burned out, 19″ Dell monitor that John in Accounts has, the grey looks white like the background, and your carefully planned visual hierarchy can fall apart and become confusing. 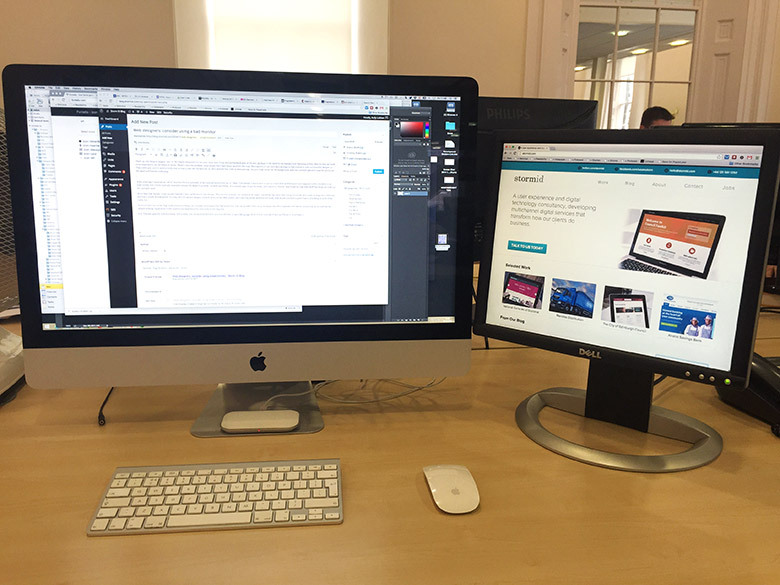 A few years ago I acquired an old 16″ monitor from a cupboard, to be a second monitor for my 27″ iMac. I tell people it was a place to put my email client and browser’s web inspector while I worked on my main screen, but I think I actually wanted to stream the Ryder Cup while I worked one Friday. It is a handy place to put my email, web inspector, Twitter, Spotify and all that other stuff that helps me work but isn’t actually work. More than that though, I very quickly learned it was a great way to test designs. This monitor is small, low resolution by today’s standards, has never been colour corrected, isn’t nearly as bright as it once was, and has a couple of dead pixels. It’s crap. But if I can put designs (created on my lovely iMac screen) onto that crap screen and they still work, then maybe they have a good chance of working for a lot of the users, too. So if you have one or two big lovely screens to design on, consider running another bad screen too. 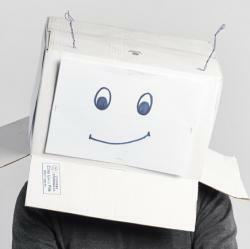 You can probably find one at the back of an office cupboard somewhere, or pick one up on Gumtree for almost nothing. I guarantee it will improve the experience for your users in the long run. P.S. This also goes for mobile screens. Add a small, low-res Android device to your test devices, or use a Device Lab. Most of your users don’t have an iPhone 6+ or a Nexus 5. Strongly agree with this. In a former job I had to take large background image adverts sent by ad agencies and prepare them for use on our homepage, using one of the dodgy 19″ Dell monitors that come free with each machine. I lost count of the number of times agencies would completely ignore our guide PSD and send over graphics that had obviously been created on their huge 27-30″ cinema displays, with logos and text completely off my average size screen. We were just discussing this the other day and an interesting side point was that most family members etc that we could list were all using newish laptops with decent screens and this is a growing trend.